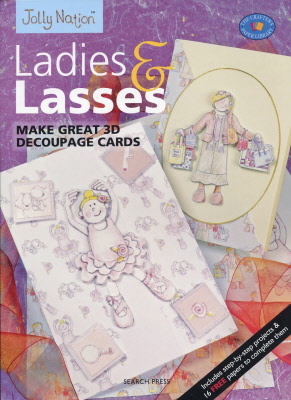 Full instructions and amusing papers to make eight 3D decoupage greeting cards featuring Jolly Nation characters. Full step-by-step instructions. Extra tip and ideas for inspiration. 16 colourful pages of instructions, 8 sheets of decoupage character papers and 8 sheets of background papers. Themes are ballerina, skipping girl, girl & pony, fairy princess, shopping lady, mother & baby, gardening lady, make-up girl.